From the start of his career to the eve of his last Test series, Younis Khan has rarely ever been afforded the spotlight. Yet he has etched his name onto the soul of Pakistani cricket forever. A rare cricketer who has always measured himself by the accolades given by the game itself, rather than ones handed out by those who run or watch it, here's a look at six of his most memorable innings. One way of spotting a great player is the fact that their debut Tests are almost always a portent of their future career. Many players have great debuts, but the great ones have opening matches that carry the narrative they will play out for the rest of their careers. Playing in a team full of legends tainted by ugly accusations of match-fixing, Younis came to the crease in the second innings with the team two runs behind and five wickets down. Muttiah Muralitharan was leading the charge and Pakistan seemed out for the count. Displaying the grit and maturity that would define him, Younis was last out as Pakistan finished 219 ahead, the highlight being the 145 he put on for the ninth wicket with an injured Wasim Akram. The effort was ultimately in vain, though, as Sri Lanka snuck home with two wickets to spare, but Younis' legend had begun to take shape. There are fans who will quibble about this entry, given that it will edge out arguably more memorable innings. However, apart from one that Younis cherishes himself, it serves as an interesting "what-if" in his career, as after the Auckland Test many were imagining him as the sort of star he would never want to become. Coming into his tenth Test, after a brief while away from the team, the young batsman had added two more centuries against Sri Lanka after his debut. After a slightly chancy 91 in the first innings, Younis' 149 in the second innings took Pakistan's lead from competitive to commanding. This particular match was made famous by Mohammad Sami's dream debut, as New Zealand collapsed in the fourth innings, but Younis' aggregate of 240 runs had several people anointing him the next big thing. As this unintentionally hilarious news story shows, the PCB hierarchy even sniped in the press in order to take claim for his genius. One of the recurring motifs of Pakistani cricket has been excellent performances by bowlers being squandered by spineless performances by batsmen. Port Elizabeth '07 proved to be an exception, though, and Inzamam-ul-Haq's 92 from No. 8 in Pakistan's first innings got him the Man-of-the-Match award, ahead of several magical bowling spells from Shoaib Akhtar, Mohammad Asif and Danish Kaneria. But chasing 191 in the fourth innings, defeat seemed imminent when Inzamam departed for 1, leaving Pakistan at 92 for 5. 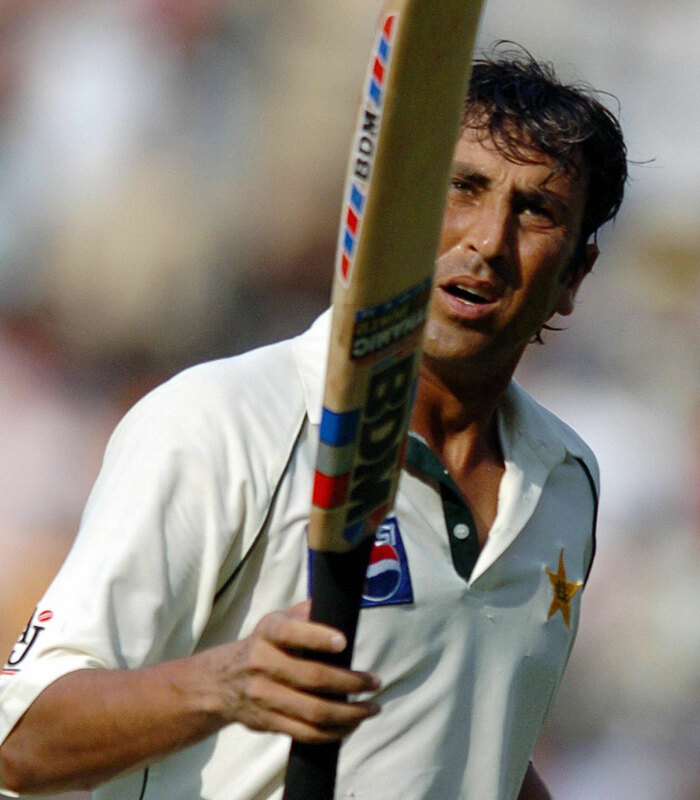 Yet this was a defining moment for Younis, Pakistan's undisputed king of batting in the third and fourth innings. Partnering Kamran Akmal, who was eager to make up for his numerous drops, Younis was in imperious touch as he counter-attacked to a famous victory. The 2007 Port Elizabeth innings was one of the few highs amid what was already becoming a slow-motion implosion of Pakistani cricket. Death, terrorism and imprisonment were all around the corner, and it meant that when Younis ascended to the prime of his career, there was almost no cricket left to play. The next era would be defined by Misbah-ul-Haq, yet Younis remained its bedrock, and the series against Australia in 2014 provided a most deserved vindication. His contribution in the first match was arguably more significant, yet this one was more memorable. Flagging after yet another decimation of Australia, he was inspired to get to 200 by thousands of fans flooding the forlorn, empty stands. A series in which Younis personally avenged 20 years of humiliation, this was the sort of organic, joyous moment that someone like him could truly savour. Cricket will remember Younis as an always-smiling gentleman, which would be appropriate but also unfair, because there are few forces in cricket as volatile as a smouldering Younis Khan. He was already in the awkward position of being vice-captain solely as to not put pressure on star batsman Mohammad Yousuf. Then, after he followed a century with a duck in the defeat in Kolkata, a board official sneeringly told Younis that his career was over - khalaas. Incensed and disrespected, Younis celebrated his first-innings ton with an angry first at the dressing room. He then rubbed his hands together in a gesture conveying the words said to him - khalaas. But while many Pakistanis have often been at their best with a point to prove, Younis didn't fall apart after proving his. He turned that hundred into a massive double-century, and then played an even more important knock in the third innings: his 98-ball 84 built on a Shahid Afridi blitz and set up a fatal Indian chase. The only match in this list where Younis won the Man-of-the-Match award, it was also one of the greatest wins in Pakistani history. No surprises, then, that Younis was at the heart of it. Two years of dominating first world teams had meant that coming into this tour, Younis was finally receiving some of the accolades he deserved. But perhaps, for such a pugnacious character, this widespread acclaim was an anathema and so Younis decided to complicate things. He developed an exaggerated crouch to an already peculiar batting stance which seemed to cause him to jump wildly at his trigger point - memorably described on Twitter as an audition for the plastic bag's role in American Beauty. A horribly scratchy series followed all the way to the final Test, where Pakistan were 2-1 down. With the odds against him now daunting, Younis was in a familiar position once more, and unfurled a majestic double-hundred. It wasn't all great going, but significantly he hadn't crossed 100 when six wickets had fallen and so the remaining runs were scored with the tail. Instead of gaining parity with England's first-innings score, Pakistan racked up a match-winning, series-squaring lead. And as for Younis, he laid down another convincing argument for why he is Pakistan's greatest batsman ever.